She's lucky that Serach is an awesome character. I told her to stand on her head; mebbe that would help, but she refused, saying 'No that would DESTROY the meaning.' Clever girl. Still, all this just to hint "Buy me perfume, dear."? But please - give us a reference of where the tattoo came from! I find it very interesting. אני מקווה שאתה מבין עיברית כי לי אין כוח לשבור את הראש בכתיבה באנגלית. הפוסטים שלך פשוט קורעים! המשך כך..
Just wana check.. Is this translation correct? Serach was the name of Asher's daughter in the Bible. if read backwards, like too many wrong hebrew tatoos, it could be also "חרס", or look-alike "חרם"... not a very positive option..
Man, the Hebrew is bad enough. I hope she didn't get the character next to the Hebrew because she thinks it's real Japanese. 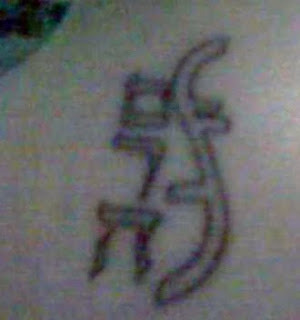 For anyone who might be wondering about that, that symbol is the so-called "G-dsend" symbol from the TV show "Heroes." It is NOT real kanji. It's a stylized RNA helix from NBC's graphic design department!